The course is fairly short at 9.3km and suitable to most runners. 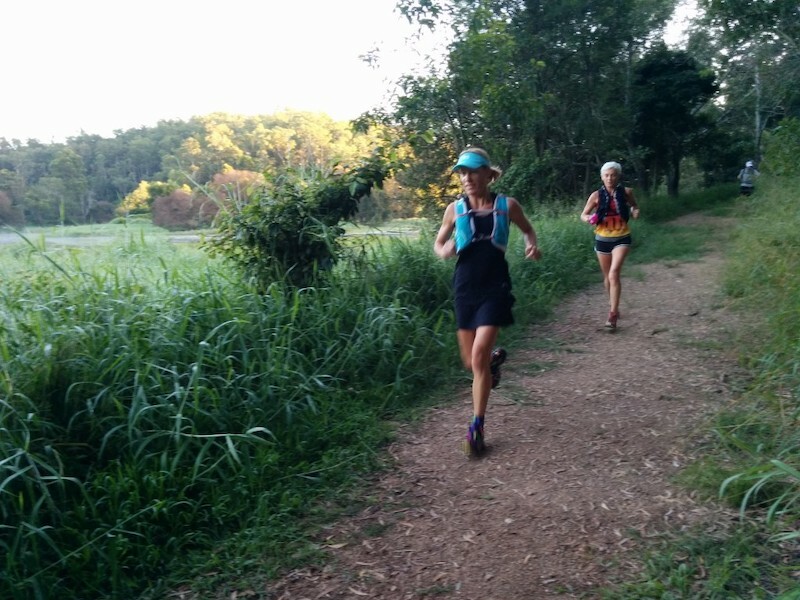 From the fast runner who would like to have a nice hit-out to people who are new to trail running or to those who would like to have a nice social run with friends. Participants must be over 16 years of age on the day. If you are between 16 and 18, you need to have your parent / guardian to sign the waiver. This event is limited to 180 participants. 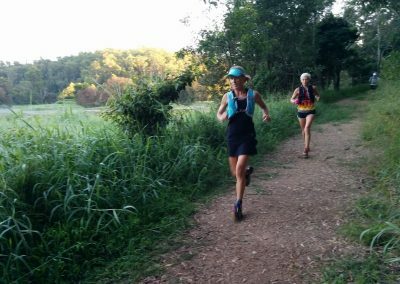 The race starts at the Enoggera Dam Wall, inside the gates of SEQ Water, which is just behind the Park ‘n Ride at the end of The Gap. The finish line is only 700m away. The start is usually in two waves, 5 minutes apart. The first wave is the fast wave, the second wave for everyone else. The first 3 females and males over the line get the placings, so if you want to be in the running for a place, make sure you enter in the first wave. There is no water or sports drink provided along this course, so if you are not sure about your hydration requirements carry at least 500ml of water. Also, make sure you are properly hydrated and fuelled at the start of the race. Please take enough supplies with you to last you for the duration of the run, but take your litter with you. Morning tea, water and sports drinks are provided to participants and volunteers at the end of the race. Coffee may be purchased from the Green Tree Frog Cafe. 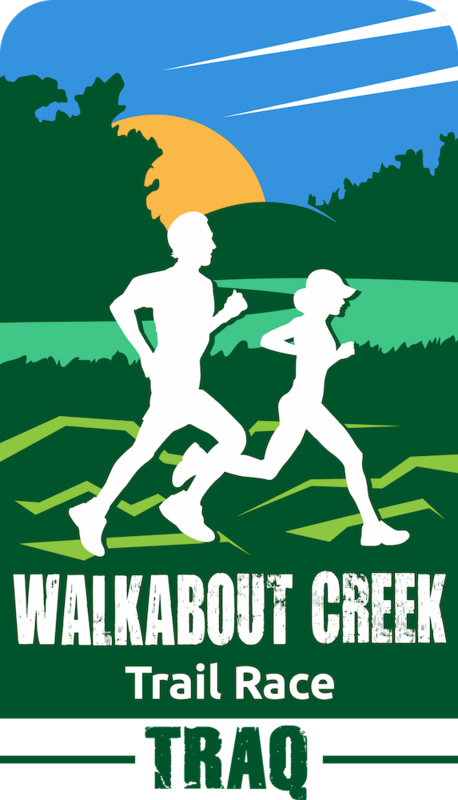 Walkabout Creek is a great area to explore, take a walk, or just hang out near the finish line to see your family and friends run the trails from across the water. 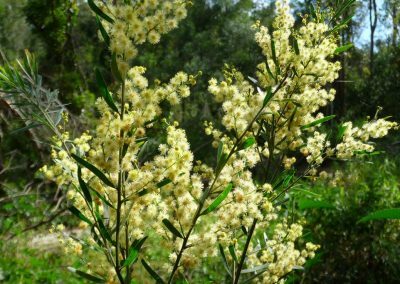 Once the presentations are done and morning tea is finished, visit the Wildlife Centre with its wombat, platypus, sugar gliders, rain forest birds, snakes and many other animals or relax from the run by kayaking the lake. 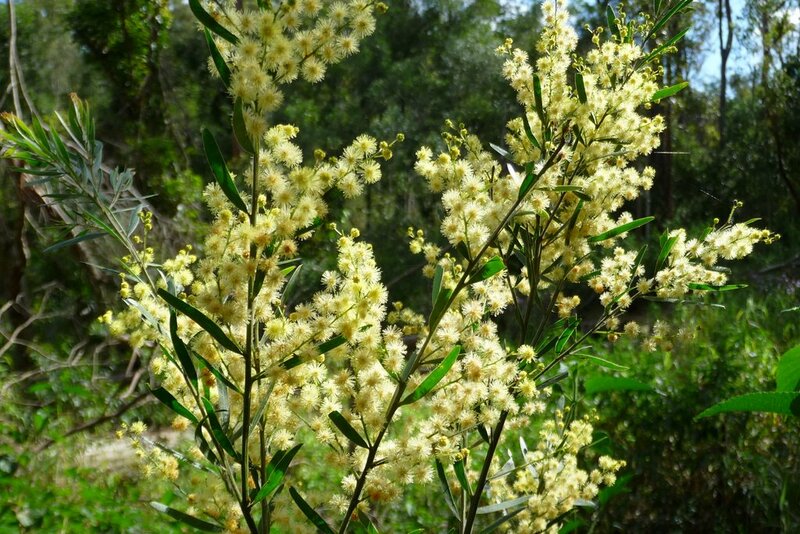 See Walkabout Creek Adventures or contact Fiona Heizmann at fiona@walkaboutcreekadventures.com.au. Park only in designated parking areas, not along the road. 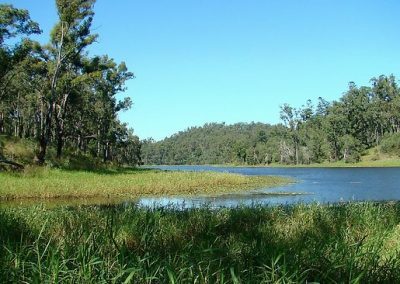 From Brisbane: via Kelvin Grove Rd, left into Samford Rd, straight through Samford roundabout onto Mt Glorious Rd, right at top of range to Mt Glorious township, continue north along range then descend past Wivenhoe Lookout to the second picnic area at Cedar Flats. From The Gap: Waterworks Road, which turns into Mount Nebo Rd, follow all the way over Mt Glorious down to the flats. * The total elevation gain and loss is around 250m, however, Suunto watches may measure more elevation and drop. There are some nice hills particularly at the start, 1km, 3km, 4.5km and 6km. 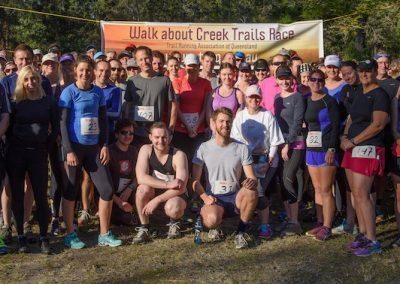 Welcome to the fourth running of the Walkabout Creek Trails Race. 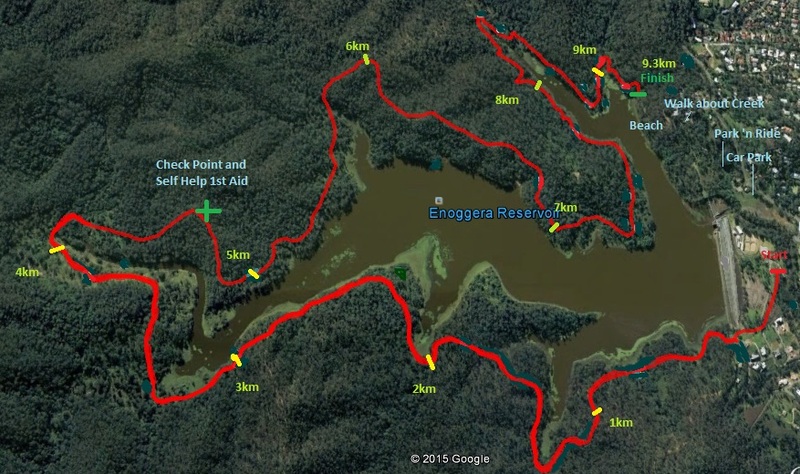 It is a beautiful course around the Enoggera Reservoir on SEQ Water land within the d’Aguilar National Park. 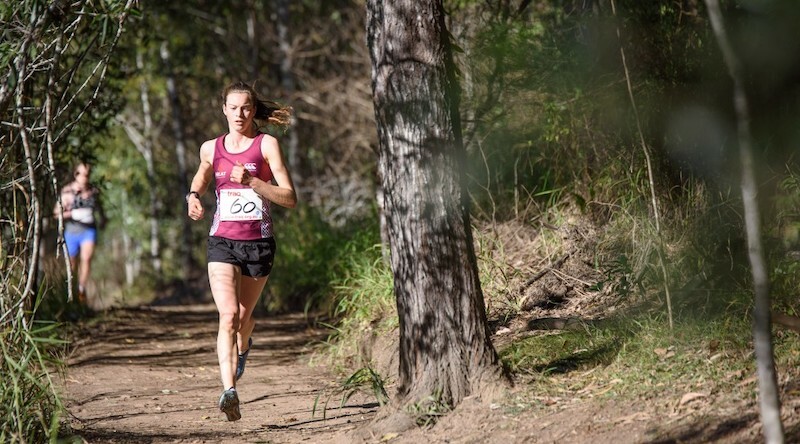 In recent years, this area has been developed for recreation purposes, which allows us to organise this race that finishes at the Walkabout Creek Visitors and Wildlife Centre aka ‘The Beach’. 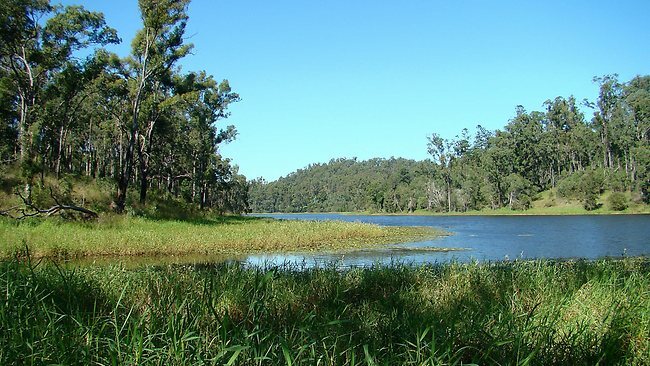 It is fantastic to have access to this beautiful area only 15minutes away from the Brisbane CBD at The Gap. 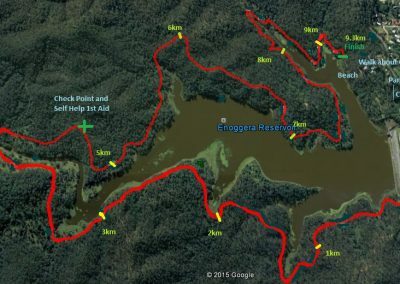 The race starts at the Enoggera Dam Wall, inside the gates of SEQ Water, which is just behind the Park ‘n Ride at the end of The Gap. 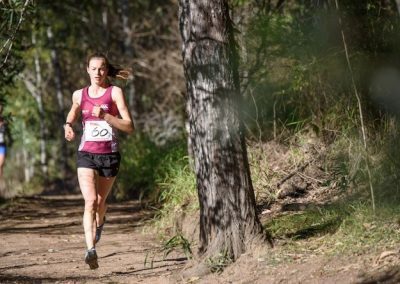 Whilst the finish line is only 700m away, the course leads all the way around the reservoir for 9.3km to finish on the ‘beach’ of the Walkabout Creek Visitors and Wildlife Centre. The course covers a variety of flatter sections, steep hills, broad fire trails and single tracks. At this checkpoint your bib number will be recorded and there will be a self-help first aid kit. A Qualified First Aid person will be at the start / finish, self-help first aid kit at the ½ way check point. Morning tea, water and sports drinks are provided to participants and volunteers. We hope you will have a great time!